Okay, I should confess. (How many blog posts start like this? A lot, it seems.) Anyway, I don't really like carrots all that much. Normally I throw them in the mix because they're orange, and I figure the more colors the better. So unless I'm having pumpkin or sweet potatoes, I sneak in some carrot. Usually peeled up with a potato peeler. These carrots, though. They were delicious. Not as delicious as the cauliflower and broccoli, but that's because they're still carrots after all. 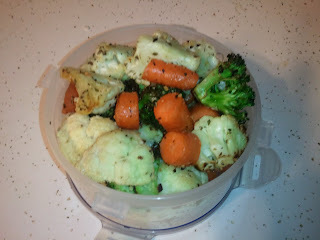 I chopped up a head of cauliflower, a stalk worth of broccoli and four or five carrots. Toss them in some olive oil and Italian seasoning. Honestly, I believe in quality ingredients. Just not always. Don't look for the logic. Put them in the oven turned to "broil." Once they looked almost done, I added some garlic salt and Parmesan cheese. There's no reason the garlic salt couldn't have gone on earlier, but I didn't think of it right off. The cheese might have burnt if used right away. Thanks to my mother-in-law for this recipe! I think she told me that she made something like this after seeing a version of it somewhere. So who knows if this resembles the original. In any case, it was so delicious that I ate about two-thirds of the pan. Ridiculous, I know. No judgement--it's veggies! As a side, I'd say this would serve 4-6 people. If you're weird and eat this for dinner like I did, it makes two meals. That's all I had left. About two cups in my favorite Tupperware. If I make this on purpose sometime--not just because I happen to have the ingredients on hand and make it up at the last minute--I'll probably get real Parmesan (not the Kraft powdery stuff) and add another veggie. Also, in the future, maybe I won't switch between first-, second- and third-person so much. Maybe. What things do you guys broil? I roast or pan roast everything--asparagus, broccoli, artichokes, sweet potatoes, turnips, garlic, potatoes, squash, onions. . . It is my preferred method of cooking veggies because it's easy and delicious. Thanks, Madeleine! 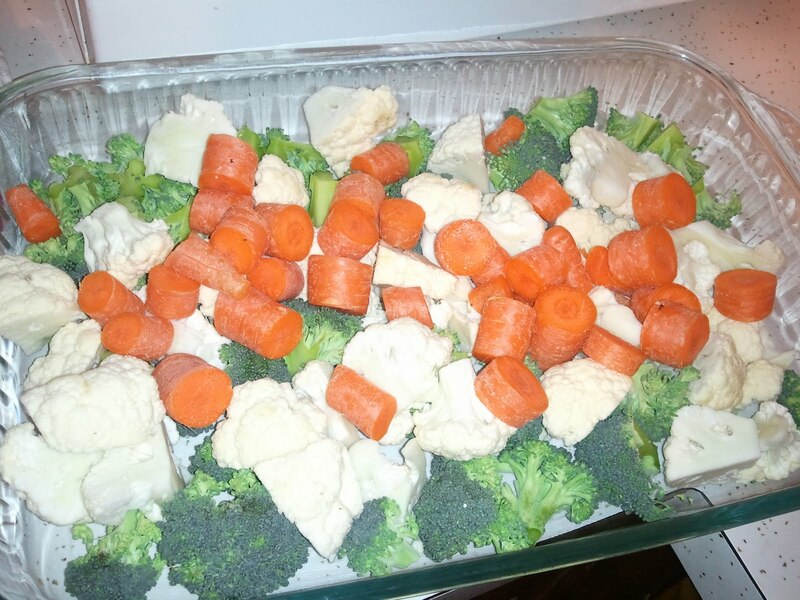 Someone asked me what she could substitute the cauliflower with, so those are great ideas. Mmmm I just finished eating this! So good. I have never cooked veggies this way and I'm glad I have a new way to do it! I cooked it for just about 20 minutes, and that was after opening the oven several times and shaking the pan (I used a cookie sheet--which I think made it cook too fast so I will use glass next time) It still browned a little on some pieces that were laying flat against the pan, but it didn't burn or taste bad. Everything was cooked through. I just used carrots and cauliflower because that's all I had. 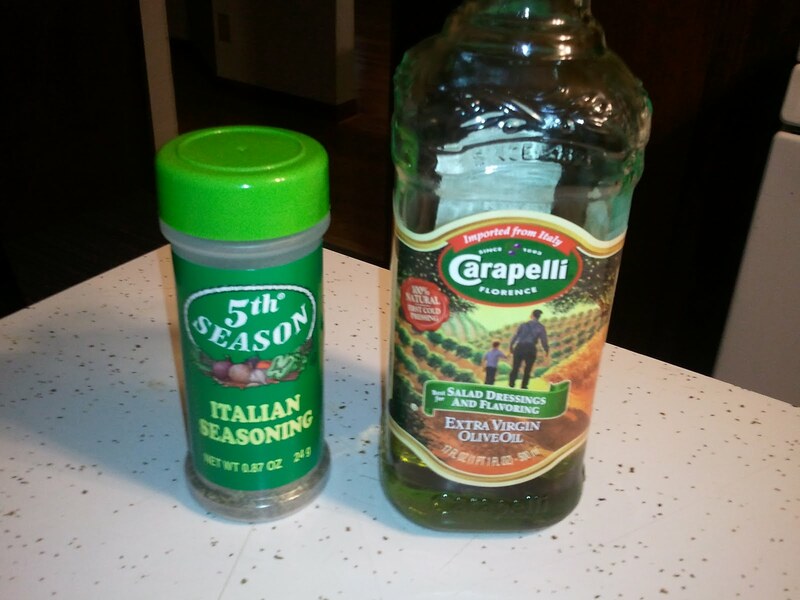 I put in the italian seasoning and little garlic salt like the recipe says, but since I am a garlic junky, I also peeled several cloves of garlic to add in. After peeling them I just crushed them lightly with the side of the knife and tossed them with the veggies. After everything was cooked, the garlic pieces came out soft and a little carmelized from the oil. I picked them out and ate them and they were delish--but not everyone likes garlic that much! Just a few probably would work. Thanks for teaching me something new! Very tasty.